For those who do not like a visible silicone joint then a Sealux Sealing Trim is an attractive alternative. With patented design this sealing trim allows for joint movement (see video below). Ledge/wall joints exposed to the deteriorating effects of modern shower environments require flexible durable joint seals. Sealux joint sealing systems are designed to seal such joints. 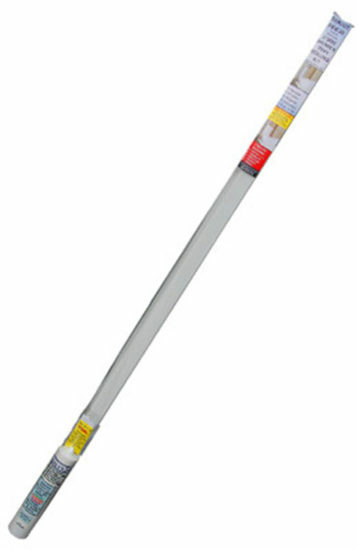 The Sealux shower sealing system combines a rigid pvc profile with Sealux-N silicone. To install Sealux the strip is filled with Sealux-N silicone and planted over the joint. Each strip has a silicone bond-breaker strategically applied to the inside face. The silicone will not bond permanently to this part of the strip. 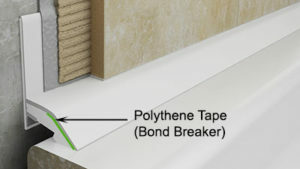 To accommodate joint movement the silicone (under tension) releases off this bond-breaker tape and stretches like an elastic band to create a flexible sealant bridge between the strip and the ledge . This ‘bond-breaker’ tape creates great flexibility in the silicone, the ‘shielding’ effect of the profile over the silicone promotes durability and hygiene in the shower environment. Every Sealux profile has a silicone bond-breaker tape (green line) strategically applied to the inside face that allows the silicone to partially release off the profile under tension and stretch to accommodate ledge/wall joint expansion.